Twitter users had fun reacting to two duelling petitions, including one seeking to rename Calgary’s international airport after soon-to-be former Prime Minister Stephen Harper. R. Curtis Mullen has launched a petition to rename the Calgary International Airport to Stephen J. Harper International Airport. Launched Monday, the petition so far has 2,970 supporters of the 15,000 it needs. “As Prime Minister Harper was the longest serving Prime Minister from Western Canada, let us honour his accomplishments by re-renaming the Calgary Airport in his honour,” it reads. Despite being born in Toronto’s Leaside area, Harper has lived most of his adult life in the western province, attending the University of Calgary and working in the petroleum industry. He was re-elected as MP for the riding of Calgary Heritage on Oct. 19. A counter-petition has been launched with 5,365 supporters of the 10,000 required. “There is currently a petition to rename the airport after Stephen Harper. I oppose this so strongly that I wanted to provide a platform for others who also oppose it,” wrote Alison Cowan, who started the petition. Twitter exploded with reaction, both about the petition to change the airport’s name and its counter-petition. 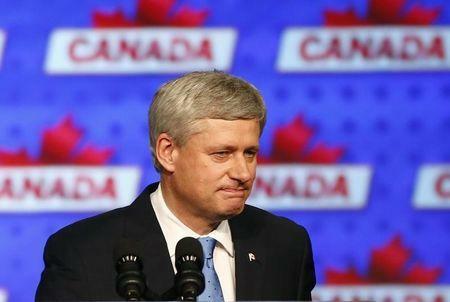 “At #HarperAirport the washrooms have no urinals. You just pee in a mug. #cdnpoli,” Ken Cox tweeted. “In fact, Trudeau airport appears on no navigation maps at #HarperAirport. They pretend it’s not ready,” @zchamu posted. Click here for more Twitter reaction. Several of Canada’s airports are named after deceased prime ministers, including Toronto Pearson International Airport, after Liberal prime minister Lester Pearson; Montréal–Pierre Elliott Trudeau International Airport after Prime Minister designate Justin Trudeau’s father; and Saskatoon John G. Diefenbaker International Airport, after the Conservative leader. An email from the media contact at Calgary International Airport said that the federal government decides matters such as airport name changes.